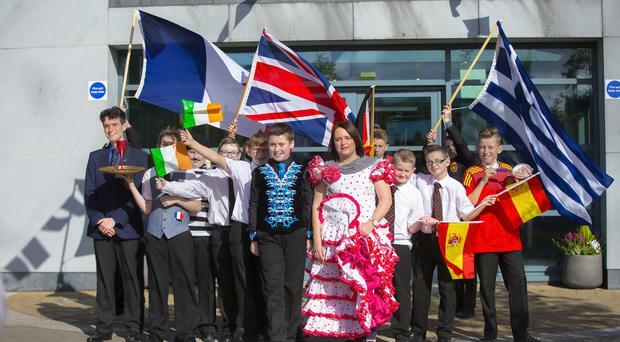 Northern Ireland has celebrated European Day of Languages hosted by De La Salle College in west Belfast. Before the multilingual assembly where pupils performed in Spanish, Irish, French and Italian, guests were treated to a continental breakfast. Head of the European Commission Colette Fitzgerald said: “It was a wonderful event and the pupils were outstanding." Ian Collen, the co-director of the Northern Ireland Centre for Information on Language Teaching and Research highlighted the importance of languages in our society today and encouraged pupils to continue learning new languages. Also from NICILT Louisa Gibson, said: “It was the best multilingual assembly I have seen. I was so impressed with how the pupils performed in so many different languages with such confidence."